Have you ever seen such a cute fat kitty? No? Well, in this game everything is real! Just do everything to reach the aim – a real delicious burger! Make his way perfect and use different tools. It is not so easy as it seems to be at first, so use all your skills and help the cat! 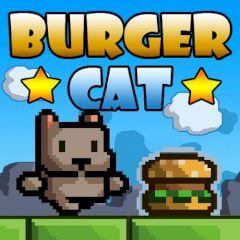 Try to guide the cat safely to the burger using the tools available in the toolbar. In this game you must release the cat before you can use the tools. The first tool is the magic wand tool. Use it to create patches of ground to the game area. Do not forget to avoid traps and use your tools wisely. Be sure that you will love this game. Are you already fascinated? Then move forward and help this little fat cat! Sometimes it will be not so easy, so do everything to reach your goal. Have fun and enjoy the game!